Dried hammerhead shark fin ready for export. Credit PRETOMA. SAN JOSE, Costa Rica -- Conservation groups PRETOMA and Turtle Island Restoration Network and have found evidence that hammerhead sharks (Sphyrna lewini) are being exported from Costa Rican ports and flown to plates in Hong Kong by way of stop-overs on U.S. soil. Eastern Pacific Scalloped hammerhead sharks are listed as "endangered" under the U.S. Endangered Species Act (ESA). The export and trade of endangered species shark fins violates the environmental law, which bans shipments of endangered species products, including "in transit" hammerhead shark fins. "We warned the Costa Rican officials that these exports would occur in violation of the ESA, but the higher authorities of the Ministry of Environment decided to proceed with the exports anyway," said a concerned Randall Arauz of PRETOMA. "We blew the whistle and alerted the U.S. authorities as well, with no positive response either." "Costa Rica's disregard for international laws designed to protect endangered wildlife coupled with the U.S. government's failure to enforce prohibitions on illegal shark fin shipments spells disaster for scalloped hammerhead populations," said Doug Karpa, legal program director with Turtle Island Restoration Network. "These unique sharks could go extinct in our lifetime if we don't end this illegal trade." 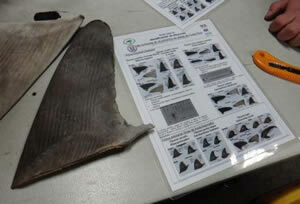 PRETOMA and Turtle Island learned that Costa Rica exported hammerhead shark fins in December and again in February. Given the routing of cargo shipments to China from Costa Rica, these shipments clearly touched down in the U.S., where they should have been confiscated under the ESA and thus been prevented from further trade and sale. However, the U.S. 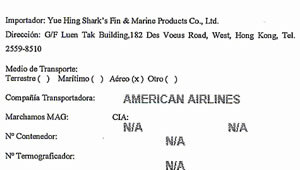 Fish and Wildlife Service failed to enforce the ESA, and allowed the shipments to continue on to Hong Kong. December 24, 2014: Costa Rica exports 906 pounds (411 kilograms) of two species of hammerhead sharks (Sphyrna lewini and Sphyrna zygaena). February 20, 2015: Costa Rica exports a second batch of 1,003 pounds (455 kilograms). "All scalloped hammerhead fins exported from Costa Rica derive from the endangered Eastern Pacific population that is protected under the ESA. The fact that the U.S. failed to interrupt the shipments the moment they touched down on U.S. soil, makes them an accomplice in the unregulated, international trade of shark fins," said Maike Heidemeyer, a biologist with PRETOMA who investigated the shipments.